Successfully Added Digital Microscope with LED Light + Image Capture Software to your Shopping Cart. The Digital Microscope that makes Science fun and lets you to view objects up to 230x closer with this high magnification feature as well as capture photos & video straight to your computer. Whether it’s for science, studies or just for fun, this Digital Microscope with LED lights provides you with the most portable and versatile way in investigating or researching any kind of substance or object. This USB Digital Microscope is a fully functional magnification tool that plugs directly into a computer and lets you see your results instantly and directly on your computer monitor. Whats so great about this digital Microscope, is the ability to see the tinniest of details, in high definition, directly on your computer screen. 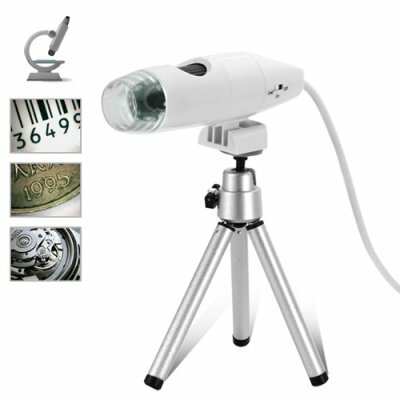 Details like individual strands of hair or even the fine scratches on a collectible coin that would be impossible to detect with the naked eye, can easily be viewed by this amazing USB digital microscope. In addition, as you are looking at the magnified objects through this USB Digital Microscope, you can take either 1.3 mega pixel photos, or 1.3 mega pixel AVI video clips for storage and later viewing. All of this is possible due to the user friendly and powerful computer software that comes packaged with each purchase. As an added bonus, this high end Digital Microscope gets its power directly from the USB port, meaning that you never have to worry about batteries or external power sources. This USB Digital Microscope is the perfect item for use in the fields of medicine, education, textile, jewellery, or just for plain fun. Available in our warehouse right now, order today and we'll express ship it out tomorrow. Brought to you by the leader in China Electronics - Chinavasion. This digital microscope is very easy to use. Even children can have fun using it! Simply install the included software CD on your computer then plug the microscope into any USB port. Open the software program to view a real-time image of your object and use the rotating dial on the microscope to adjust the focus of your image. Can I use this digital microscope with my Linux, MAC or Windows 7 computer?